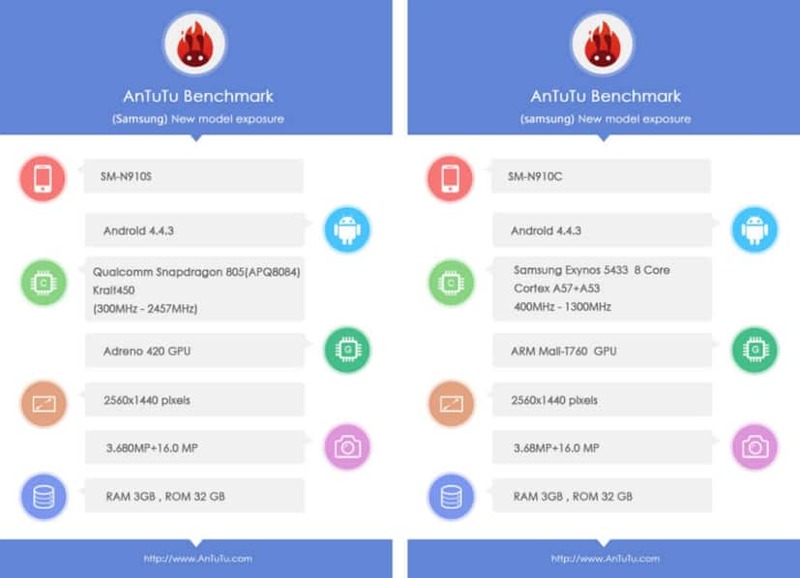 The Japanese Benchmarking site Antutu has just published benchmark results for two versions of Samsung’s forthcoming Galaxy Note 4, finally confirming some detailed specifications for this device. Why two versions? As is typical of Samsung phones, one version runs on an Exynos processor, the other on a Qualcomm Snapdragon SOC (system on a chip). As with other recent Galaxy devices, we can expect North America to get the Snapdragon equipped version, the rest of the world the Exynos-powered phablet. Aside from the processor, both versions provide the same hardware, and what hardware it is! A QuadHD, 2560×1440 pixel display leads the list, with 3 GB of RAM and 32 GB of storage (16 and 64 GB versions have been rumored, as well), a 16 MP rear camera joined with a 3.68MP selfie cam, and Android KitKat 4.4.3. The North American version packs a Quadcore Snapdragon 805 clocked at 2.5GHz, the international version an 8-core Exynos 5433 running at 1.3 GHz. 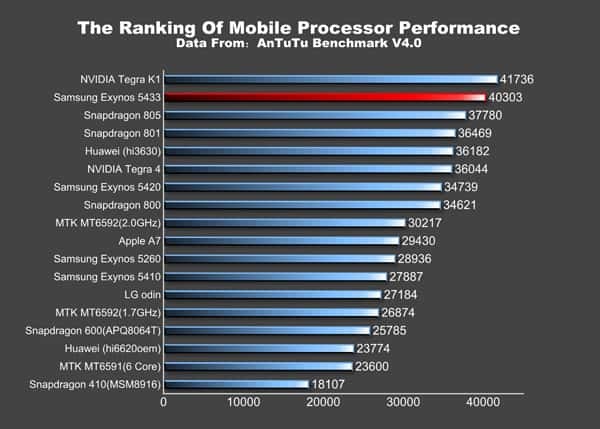 The Exynos chip tests marginally faster in the Antutu benchmark, but both handsets should be among the fastest available. The only real surprise here is KitKat 4.4.3, rather than the latest 4.4.4, but it’s likely Samsung didn’t have time to finish it’s customization of the latest version before release. It’s safe to assume that both handsets will eventually be upgraded to Android “L” after it becomes available. Now we’re just waiting on pictures, and hands-on, of the final hardware.